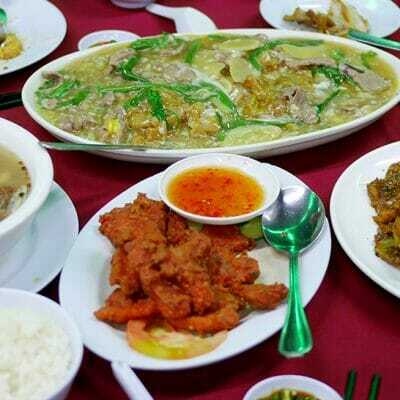 Thai food is something Jien and I have most in common with, among the rest of our favourite cuisines. Flavours are exciting and textures are amazing, which leaves us satisfied more often than not. 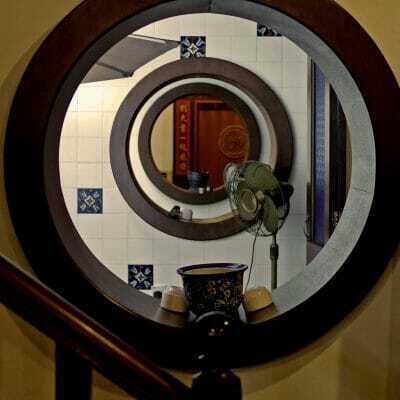 We’ve heard good things about Baan Rao in Petaling Jaya, said to serve hearty Thai food that’s not a pain for the wallet. 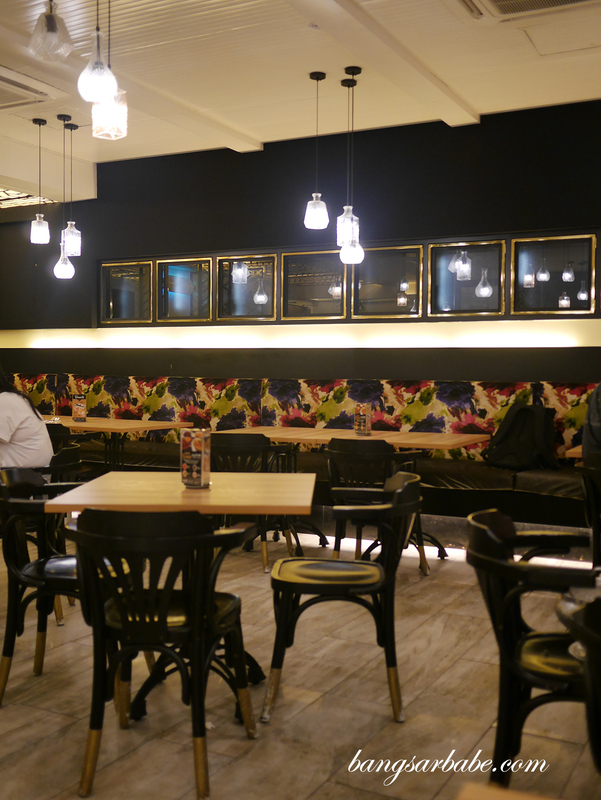 Like most popular restaurants, expect a queue or a large crowd if you don’t call up to book a table. We were only third time lucky with Baan Rao for the first time we walked in without a reservation, they were fully booked and the second time around, they were closed for an event. 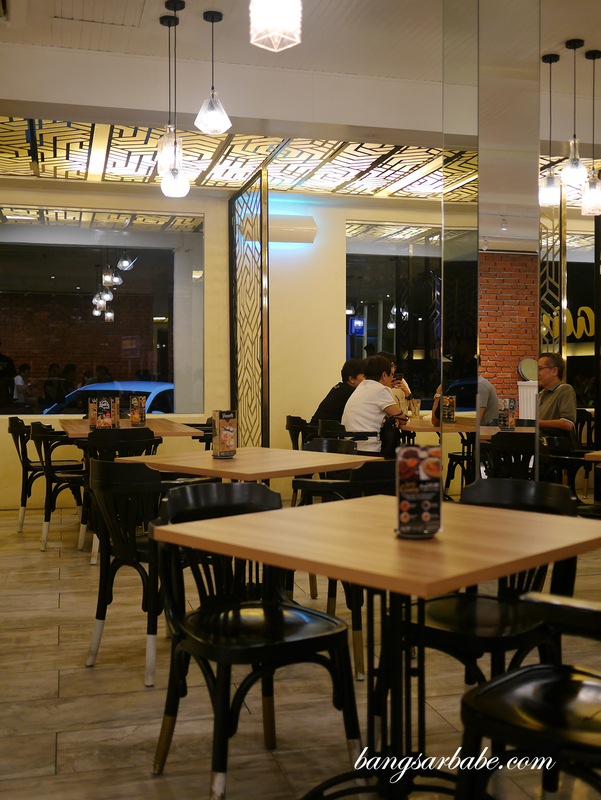 Service is fairly quick but during peak hours, can be a bit scattered like what we experienced when we dined there. Despite calling ahead to reserve a table, I arrived to find my table wasn’t ready and the staff had to “put together” a table at a random area to sit my dinner party. 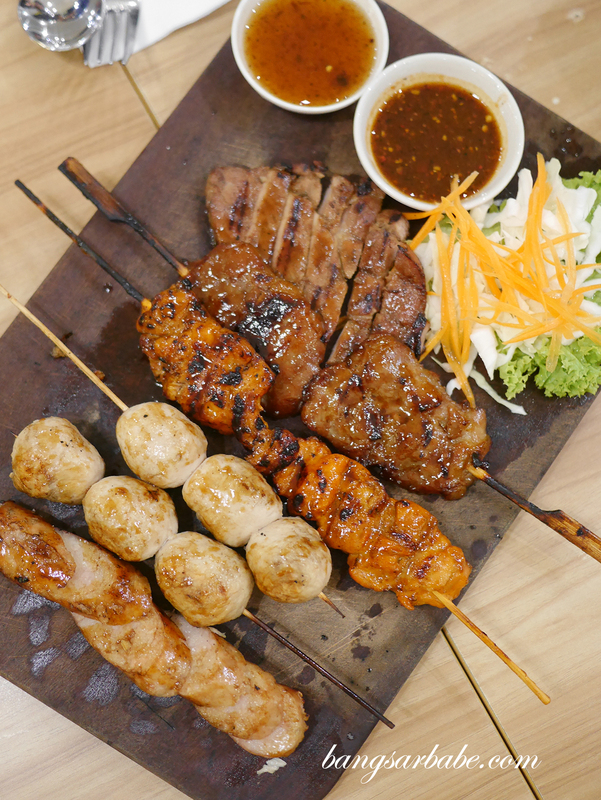 Baan Rao’s Mini BBQ Platter (RM27) comprising a tasting portion of grilled pork, grilled chicken, pork meatball, pork neck and Isaan style pork sausage looked delicious but failed to deliver in terms of flavour. While the moo ping had good seasoning, it lacked the eminent char I look for when it comes to grilled pork skewers. The pork meatball had too strong a flavour and dry texture, and the pork neck too, was dry. 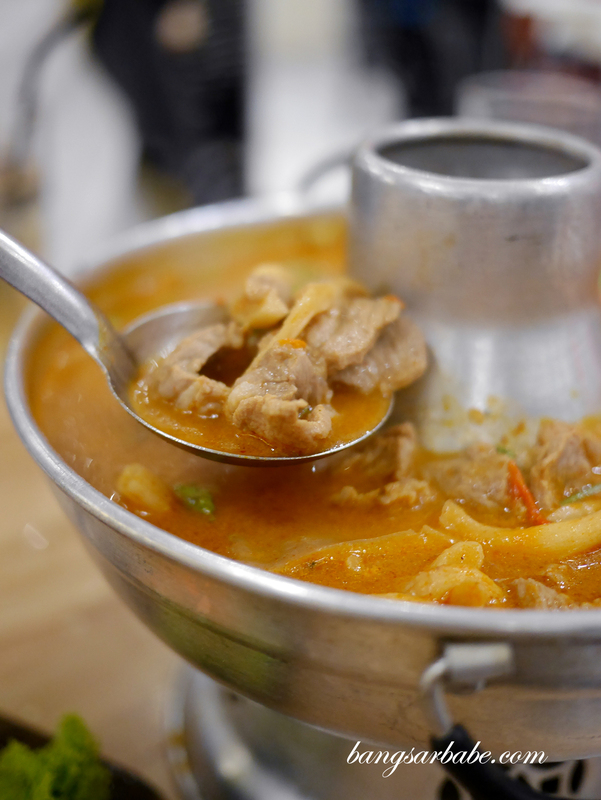 The Isaan pork sausage was decent – a fermented pork sausage with strong hints of garlic. Not everyone’s cup of tea for some might find the flavours a tad strong. Grilled chicken was one of the better ones on the tasting board as it was moist enough with charred bits for character. Jien and I have mixed opinions about the Tom Yam Nam Khun, which we opted to come with pork slices (RM15 – small, RM30 – large) rather than seafood (RM23 – small, RM43 – large). This was a robust pot of soup, accentuated by lemongrass, kafir lime leaves and galangal. 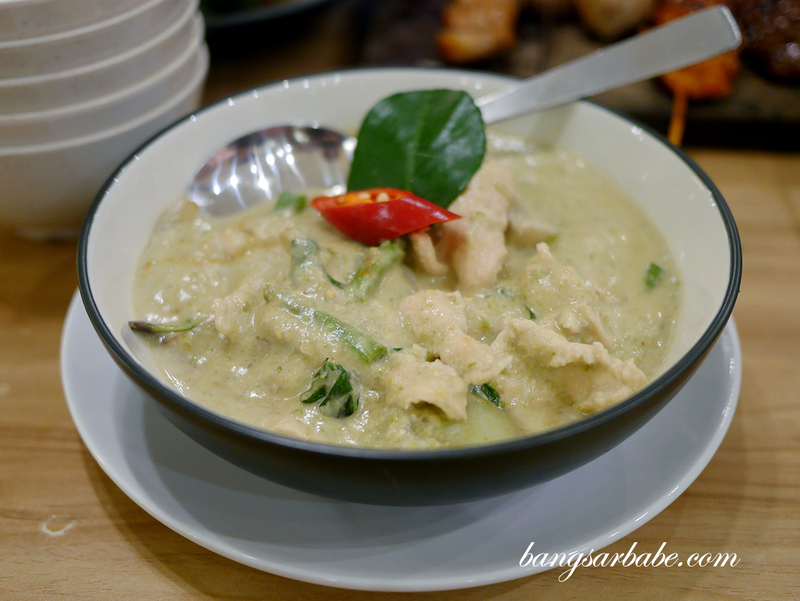 I find it a tad sweet and lacking an unctuous finish which I rather like in my tom yam. Jien however disagrees; claiming it’s quite decent. 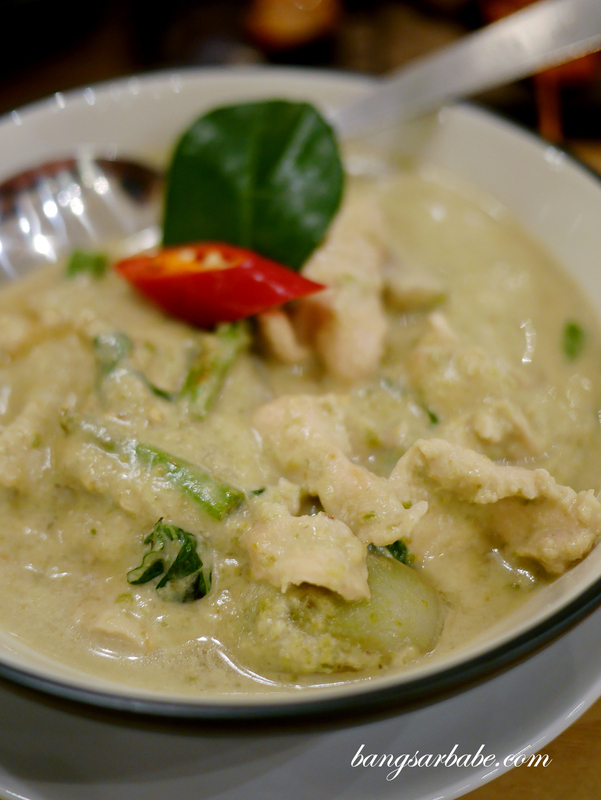 We do however agree on the Green Curry Chicken (RM23), a sumptuous serving of rich gravy and tender chicken pieces. You get that fiery note after the creamy mouthfeel, which gives this dish balance. 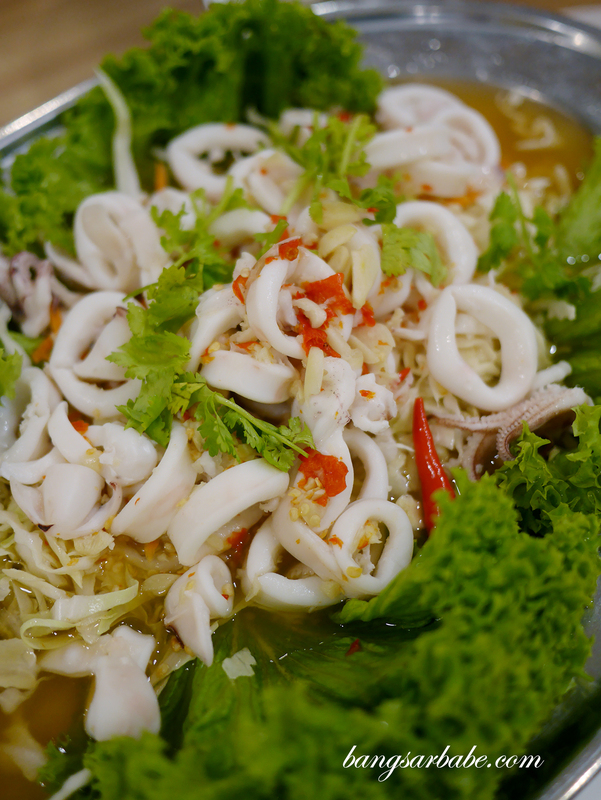 Also fairly exciting is the Steamed Squid in Chilli Lime Sauce (RM33), a fiery dish that hits all the right notes – tangy, spicy, sweet and savoury. The broth although packed with flavour, was light and complemented the squid, which was tender enough. 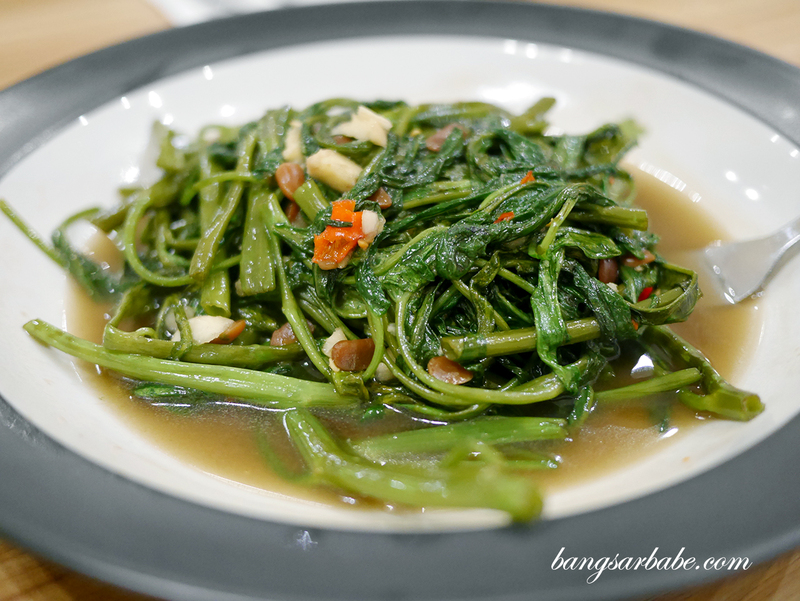 Stir Fried Kangkung (RM15) makes a safe option for greens and Baan Rao does it adequately well. The gravy packed flavour from the garlic, chillies and bean sauce, and the water spinach was cooked just right so it still retained crunch at the stems. I think Baan Rao’s Tub Tim Krob (RM6 per portion) deserves a mention for it is one of the better ones I’ve eaten in Klang Valley. The red ruby features crunchy water chestnuts encased in tapioca flour, served in sweetened coconut milk and shaved ice as soft as snow. 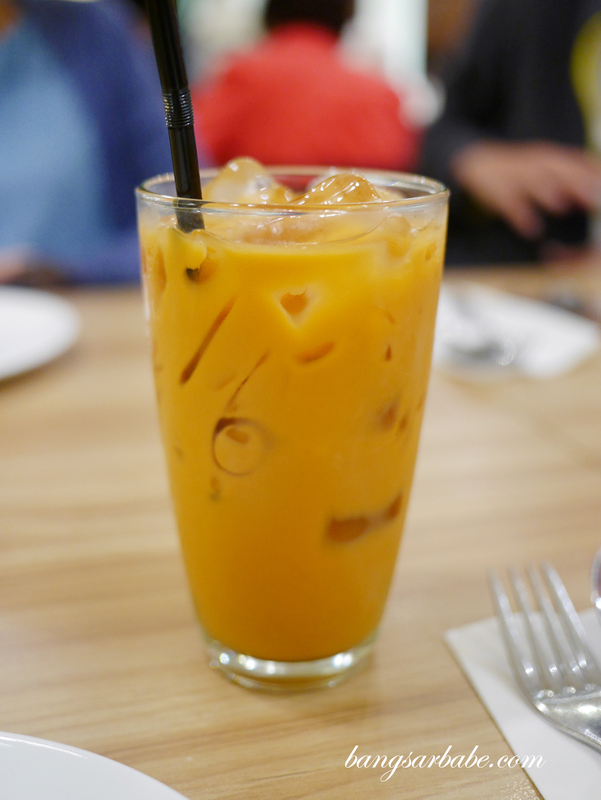 Skip the Thai Iced Tea as it is watery with only a hint of tea flavour. A devastating drink, if I may so. 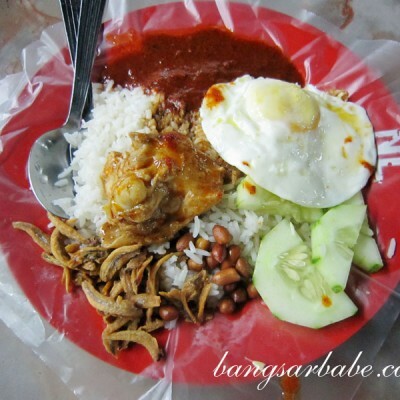 Our bill came up to about RM180 for 5 pax – pretty reasonable considering what we ordered. 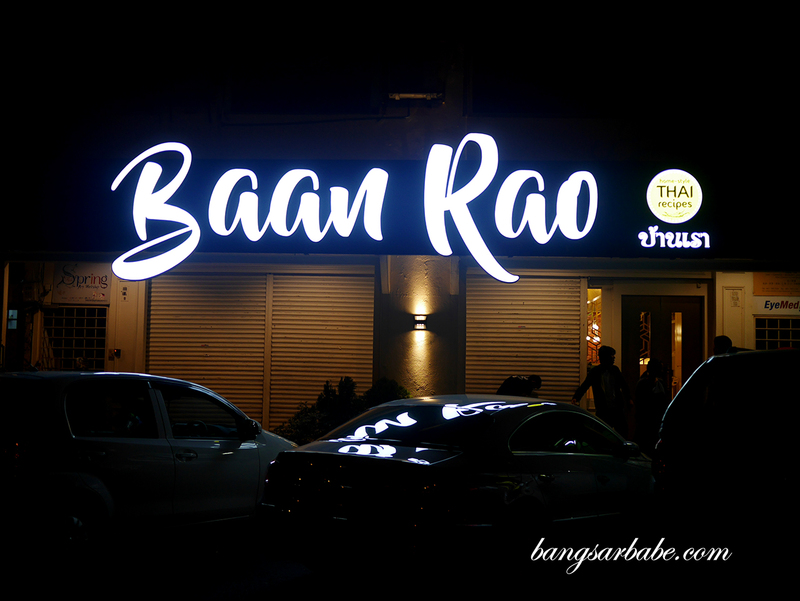 Food is hearty and while there were some misses, I think Baan Rao is a reliable spot for Thai cuisine. Verdict: Pretty good food and reasonable prices. The tub tim krob is a highlight.